Several of us were on the P-G filmsite just recently and among the many things we did was: 1) pull more measurements from stump to stump (seen in the film) and stump to tree. 2) pull measurements of trees seen in the last section of the movie. 3) Using a man of 6 feet 2 inches as our "Patty" to do several recreation FILMS using Kodachrome film using my FIXED lens Kodak K-100 16mm movie camera. Both the 15 millimeter (mm) and the 25 mm lens was used. I was told by Rowdy Kelley there still are a few places that will develop Kodak film but the movie has yet to be developed. 4) Revisit sight lines as seen in the original movie. 5) Look for fixed artifacts that can still be seen today. This was a very productive outing and several of us spearheaded the project: Rowdy Kelley; Kipp Morrill; Robert Leiterman; Michael Wyman; myself (Daniel Perez, Bigfoot Times) and several others. 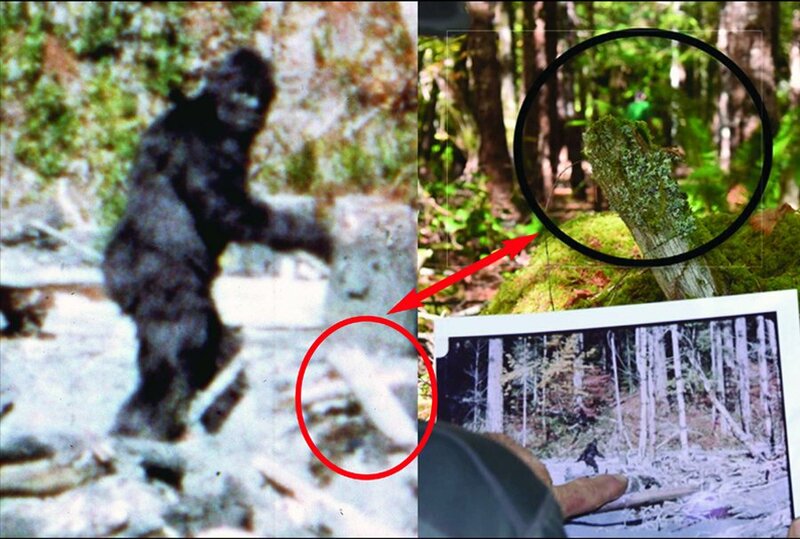 I have attached a composite image created by Chris Murphy of the image of Robert Leiterman's backside with him pointing to a dead branch seen in the original movie film from October 1967. Using our "sight line" that branch proved to be in exactly the right spot. We were told by a man by the name of Mike Meraz, who attended our gathering that he was with the late René Dahinden in October 1985 and that René showed him the filmsite and that he explained the big log seen prominently in the P-G film never went anywhere, it just dissolved into the ground. In closing out this brief submission we were delighted to be greeted with excellent weather for this outing. After reviewing this composite photo on Easter Sunday, April 21, 2019, keep in mind the branch stickup up from the fallen tree is quite a bit in front of the subject, although you may get the impression they are in the same plane. Great work! That crick bottom is almost unrecognizable! Great work by you and all, Daniel. Yep. I certainly wouldn't have been able to find the location because it IS unrecognizable. Good luck to anyone trying to film a Patty is that stuff. It just goes to say how right all of the elements were for bob and Roger to do what they did back when they did it. 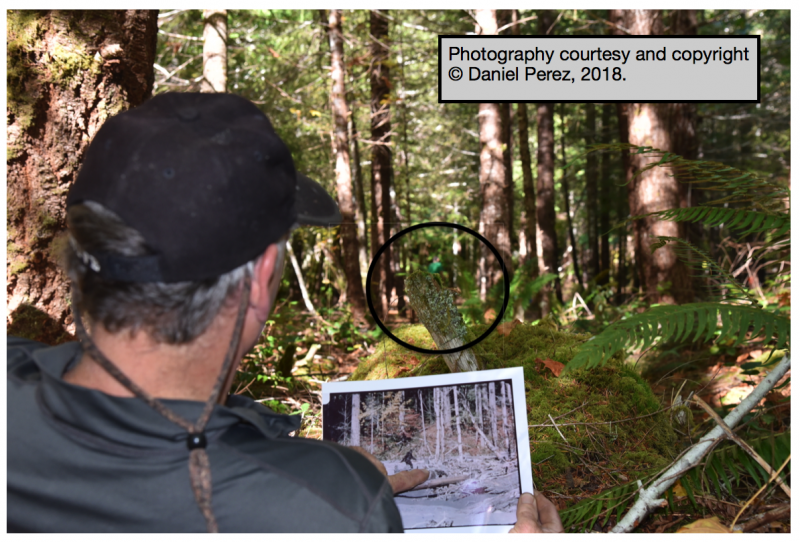 If they were going to pull off a hoax it would seem to me that somewhere as forested as what Mr. Perez posted would have been better 'suited' (see what I did there?). This has tweaked my curiosity. Re-creation movies are planned with Kodachrome 16mm film. Is this film tungsten type with compensating filter or daylight balance? Why not use a contemporary E-6 development film? Kodachrome still photography film can be developed in Kodak Dextrol chemistry and the result is a black & white negative. Kodachrome was a 3 layer black & white film emulsion. The colors were added in the chemistry soup. The chemicals are gone. I am wondering how you set the exposure if you did not know how the film reacts to processing? I assume that you set up for 24 frames per second. Do you know that the K-100 is accurate at 24fps? Good luck with the 'retro look' movies. A lot of effort, time and money will be swallowed up. Sidebar: Back in the day, I believe that 'Kodachrome' was invented by a couple of concert musicians. It was the best. I have Kodachrome slides in dark storage that are older than many forum members. Id be curious to know how tall the stick and the rock are. Edit of Kodak chemistry: should be 'Dektol' not Dextrol. Closest place that I talked to about developing Kodachrome slide film is Portland, Oregon. Expensive manual procedure for 36exp. 35mm film. 1) pull more measurements from stump to stump (seen in the film) and stump to tree. Hello Gigantor: two things will solve your skepticism: visit the P-G filmsite for yourself and see with your very own eyes several stumps seen in the 1967 still visible in 2018. The other might be viewing images of the stumps as photo documented by me from 2012 to the present. THEY ARE STILL THERE, amazingly. Granted, I could probably take my hand and destroy them. They appeared water logged or something along those lines (perhaps rotted out) with many fissures or cracks in the stump. Like you, I am astounded they still exist but there they are. There has been one place that has published more data about the P-G filmsite and the circumstances than any other publication. The Bigfoot Times. For only $17.50 year you can read a bunch of stuff that is rarely seen on the Internet. Daniel, you own The Bigfoot Times, correct? Cool. I just ordered my copy. I have a ponderosa snag on the ranch still standing thats almost as old as I am...... And hand split cedar fence posts probably pushing 100 years old. Has anyone ever brought up why that tree stump by Patty looks like it was cut by a chain saw? Why would a tree in a hard to get to area be cut by a chain saw, doesn't make any sense to me. But the other factor is, if you are going to pull off any type of fake film, why would you do it in a hard to get to area? It seems if that stump was the result of a tree being cut down leaving behind a stump, it would of been done very near a road, not in a hard to get to area. This would lead to the film actually being a fake all along. That piece of wood in Daniel's photo should not be there if that's the actual location either by decay or by high water levels, being either buried by debris or swept down stream. Personally, ever since first seeing the footage, I was a believer. Just never noticed that stump before as I was always looking at Patty. I don't see that as having obviously been cut by a chainsaw. Just above where the red circle is in the photo uploaded by Daniel, next to Patty's hand. Zoom in if need be.